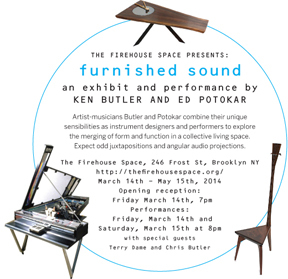 The Firehouse Space presents: FURNISHED SOUND, an exhibit and performance. Featuring Ken Butler and Ed Potokar with special guests Terry Dame and Chris Butler. Re-thinking the possibilities of domestic objects, artist-musicians Butler and Potokar combine their unique sensibilities as instrument designers and performers to explore the merging of form and function in a collective living space. Crossing the boundaries of art and design, the artists present an integrated installation that includes Butler’s “Urban Grand Piano”, which plays live radios and projects images, and Potokar’s very playable “Two String Bass Dining Chair” and “Drum Table”, forming a tantalizing piano trio ready for an unusual and transformative musical journey. Expect odd juxtapositions, angular audio projections, and other hybrid antics. An opening reception begins both nights at 7:00pm. Performances will begin at 8:00pm downstairs, then upstairs. Ken Butler is an artist and musician whose Hybrid musical instruments, performances, installations, and other works explore the interaction and transformation of common and uncommon objects, altered images, sounds and silence. He studied viola as a child and maintained an interest in music while studying visual arts in France, at Colorado College, and Portland State University where he completed his MFA in painting in 1977. His works have been featured in numerous exhibitions and performances throughout the USA, Canada, and Europe including The Stedelijk Museum in Amsterdam, Mass MoCA, The Kitchen, The Brooklyn Museum, The Queens Museum, Lincoln Center , The Metropolitan Museum of Art in New York City, as well as museums in South America, Thailand, and Japan. His works have been reviewed in The New York Times, The Village Voice, Artforum, Smithsonian, and Sculpture Magazine and have been featured on PBS, CNN, MTV, and NBC, including a live appearance on The Tonight Show. Awards include fellowships from the Oregon Arts Commission, the New York Foundation for the Arts, the National Endowment for the Arts, and the Pollack/Krasner Foundation. Ed Potokar, the son of a latin jazz and polka drummer, started his art, design and musical career as a curious adolescent in Cleveland. He created homemade instruments as a teen and later mastered his skills at The Cleveland Institute of Art, where he earned a BFA. While there, he joined his first band and played a custom welded steel drum kit with hammers and grinders. Potokar then began inventing and fabricating unique musical instruments, affectionately referred to as the “boxes.” These analog synthesizers helped create a signature sound and serve as the foundation for the renowned punk/funk/art/metal/wave musical group, the Audio Artists. After moving the New York City, he founded MUSIC FOR TV, a successful downtown Manhattan music production house, and wrote the theme music for MTV’s “Unplugged.” He also toured with groups in North and South America and Europe. Potokar has created his own line of high-end ribbon microphones called Potofones, and has designed and built custom homes and designer furniture. 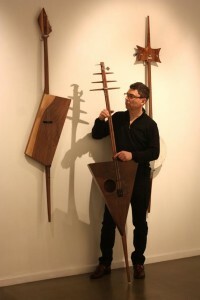 Terry Dame is a composer, multi-instrumentalist and instrument builder. Daughter of a piano teacher from a small western Massachusetts town, she began playing trumpet and piano at age 8 and continued playing into hight school. Upon entering college she put music aside and studied engineering, graduating with a degree in Environmental Design from the University of Massachusetts. After working a desk job at an environmental planning agency for about a year, she couldn’t resist her creative impulses, so she bought a synthesizer and started composing and performing music with a local theater company. Dame moved to New York City in 1985 to study audio engineering at the Institute for Audio Research in Greenwich Village. On the first day of classes she drove to school, which turned out to be about 6 blocks from her apartment, couldn’t find a parking spot and went home never to return, deciding once and for all a career in engineering wasn’t meant to be. She has been living in New York City composing and performing for film, video, theater, dance, and concerts ever since. She joined the Women’s One World (WOW) theater collective and produced four multi-media concert performances from 1986-1990. In 1994, she scored her first feature film collaborating with director Maria Maggenti on “The Incredibly True Adventure of Two Girls in Love.” Additional collaborations include film makers Judith Helfand, Jennie Livingston, Diane Bonder and Erin Greenwell, performing artists Lisa Kron and Jennifer Miller and The Split Britches Theater Company and choreographer Jennifer Monson. Chris Butler, a seminal New Waver from Cleveland, OH, has spent 40+ years with one foot in the pop music world, one foot in the experimental avant-garde, and a third foot in his mouth trying to justify being in both. Chris has been extracting crude/beautiful noises from Ed Potokar’s extraordinary instruments at live shows, gallery openings and on recordings, and has been a fan of Ken Butler (no relation genetically, 100% related esthetically) since sharing the bill with him at a Catskill, NY performance that must have thoroughly confused the three and a half members of the audience. Chris is thrilled to play with both of these geniuses, and welcomes the break from his current projects-promoting “Easy Life”, an audio/theatrical CD of songs and spoken work pieces relating to the murder of four students at Kent State on May 4th, 1970, and finishing a new CD of songs about being oldoldold called “Got It Togehter!” (misspelling intentional).